Currently underway at the Kichik QalArt gallery in Icherisheher is an exhibition that we felt was well worth bringing to your attention. Kelaghayi: Past-Present-Future explores the mesmirizing kelaghayi silk headscarf from all possible angles – from its origins on the Silk Road to its use in Soviet propaganda and its recent reinvention as a global fashion item. 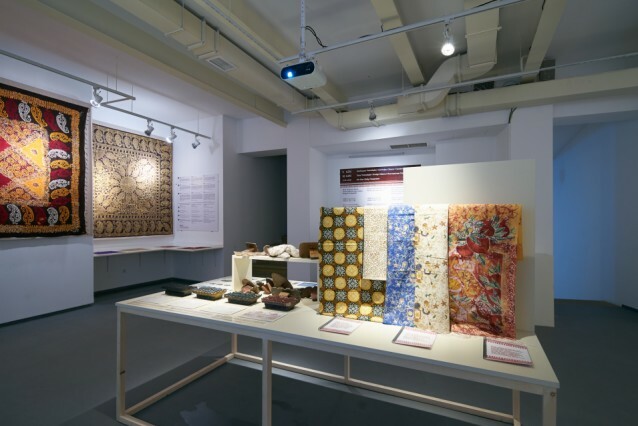 The exhibition has been curated by Asli Samadova, a self-taught curator and pioneer of independently produced exhibitions in Azerbaijan, and its contributors range from the Tbilisi Museum of Silk to contemporary designers, collectors and historians. Asli’s inspiration for Kelaghayi: Past-Present-Future came after a research trip to the Kelaghayi Centre in Basqal in 2015. Indeed it’s thanks to this centre, founded by Professor Rena Ibrahimbekova in the early 2000s, that the quaint village of Basqal in the Ismayilli region is today at the forefront of an Azerbaijani kelaghayi making revival having found itself on the verge of disappearance after the collapse of the Soviet Union. The exhibition eloquently explores the kelaghayi’s rise, fall and revival, as well as its characteristics and the processes involved in its creation. Over three floors visitors learn how the exquisite scarves are produced from silk fabric and natural dyes, and examine regional variations in colour and ornamentation. Interactive displays allow you to experiment with the different ways kelaghayis have been worn over time and even to play around with creating your own designs. You’ll also be able to see how they have been represented in art and film and to chart their development from practical clothing item to national symbol and fashion icon. A full review will follow in the next issue of Visions, but in the meantime we consider Kelaghayi: Past-Present-Future well worth visiting.